Whenever I go to look for a card or stationery to send I never feel like I find something that feels truly personal. Especially in the case of cards for any holiday I don’t usually feel like the sentiment is quite right. What I need is a little Miss Pickles Press! The designs above are just a few of the many great designs my friend Jen has in her creative arsenal. Jen is a good friend of mine from our advertising days in Boston who has since branched off on her own to create a very successful custom design biz, doing everything from weddings to small businesses to whatever else you can imagine putting on paper. I called my talented friend to enlist her in helping me design my own custom stationery and funny enough it just so happens she was already working on it as a wedding gift, doh! Seriously though, check out her stuff. She will take good care of you. If you want to go the personalized route, something handmade is a pretty great way to go as well. I used to make stuff all the time as a kid but it’s just not something I really do anymore. 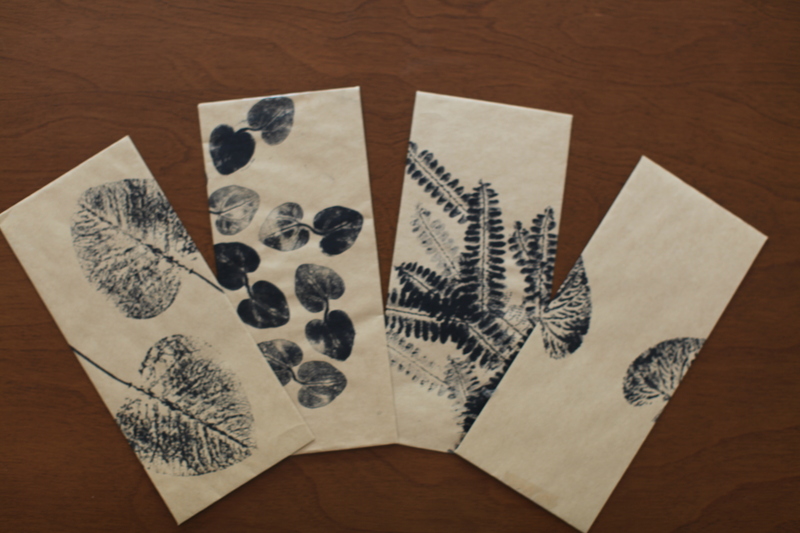 Before we moved to Boulder, my husband and I did a leaf printing class at one of our favorite stores in LA called Tortoise. An artist visiting from Japan taught us how to use what’s around us to create interesting handmade printed stationery and envelopes. Ours were the product of wandering around Venice and collecting different types of leaves we found. This is something I want to do again since I think it could be cool to create stationery from our garden. It’s easy just to get caught up in the daily convenience of email. This week has reminded me to stop every now and then and take the time to send something a little more heartfelt to those you love. You are currently reading personalized mail at 52 To Do.